The Dumulon property consists of 49 contiguous cells, covering a total area of 2,579.57 ha. The project is located 20 km south of the Nemiscau airport and can be accessed by helicopter. The Dumulon project offers strong lithium potential in a well-established area. The lithium pegmatites tend to occur in swarms in the volcano-sedimentary units. 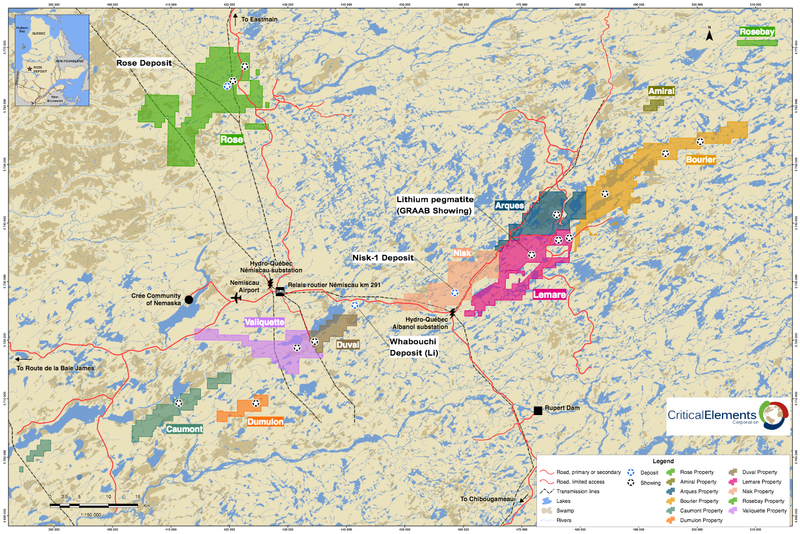 The Dumulon property covers a large part of the regional volcano-sedimentary unit, a favourable unit that hosts Nemaska Lithium's Wabouchi deposit and the Lemarre showing. The property is located in the central part of the Lac des Montagnes volcano-sedimentary formation. The geology covered by the property is mainly composed of paragneiss with local granitic intrusions. South of Indian Lake, discontinuous lenses of metabasalts and amphibolites are mapped. Strong EM anomalies are associated with plurikilometric magnetic bands oriented NO70°. The property is currently known for its SEDEX type deposits and disseminated and replacement gold deposits potential. All conductive anomalies appear to be caused by a graphitic shear zone mineralized in pyrite and pyrrhotite. The Dumulon showing is associated with a carbonate dyke, 60 cm wide, embedded in an outcrop of metasediments. The sphalerite and galena mineralization has returned four grab samples with values between 1.2 and 4.6% Zn, associated with Pb levels between 0.4 and 3.0%. In addition, three grab samples returned gold values of 0.19 g/t, 0.25 g/t and 0.29 g/t Au.